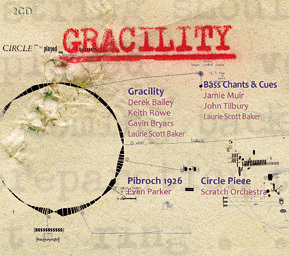 Gracility comes out of the development of free improvisation & groups such as Scratch Orchestra etc. & the general questioning of the music establishment. Text and graphic pieces were a new way of expressing music & sonic ideas in the 60's but in fact this form had existed in medieval times. Gracility required a new type of performer who understood the theories and practice but importantly, were developing their own techniques and interpretation methodology. The whole idea for the piece reflects my activities in improvisation going back to the early 60s in Sydney. Pibroch 1926 Initially inspired by the evocative singing of Calum Ruadh in his Lament for Arnheim. In combining traditional elements such as Pibroch improvising tradition with the bardic legacy of reflecting life in music, not shying away from social comment, and knowing a performer like Evan Parker would add his own sub text, I wanted to make a musical contribution to the greatest struggle facing humanity against exploitation symbolised in the 1926 General Strike. It is part of a longer unreleased work, Will of the People. I see this music as being on the cusp of the new and it is one area I have concentrated on. Bass Chants & Cues No time to rehearse, just straight in after performing Frederic Rzewski's, Coming Together with its gruelling bass part. The piece opens with an organ and synth chant & gradually builds. I was using both my tape recorders, one in record the other in playback, spaced apart, with a second track playing a low level bass figure. The shorter echo comes from a valve Binson Echorec, an Italian job favoured by showbands, which used a metal wheel as a recording medium. Jamie, a high energy drummer, explosive, and its very evident here on the later tracks. I'm using my Futurama bass guitar with the frets removed and a very early VCS3. Tilbury's Lowery T2 organ had a switch which allowed the whole tuning to slide up to a chord, he uses this on Music Hall Tripping. Circle Piece I experimented with graphic scores as it was a way to illustrate the form and structure of a piece and I had the skill to do it from my art background at Sydney Morning Herald. I had also scavenged some unusual Letraset, raiding the rubbish bins at the factory for discarded sheets! The score is partly on the CD cover and it came with instructions. I sent Ellsworth Snyder, a champion of avant-garde art and music, some of my work, including Keyboard Pieces and Extra Material, a collection of loose leaf pages in a folder, following a chance meeting at the South Bank. He liked it so much he passed it on to his friend David Tudor who, in an interview with Victor Schonfield described it as "gorgeous" . Performed by members of the Scratch Orchestra, including the musicians sub groups PTO & CPE, many of whom I was associated with prior to its formation in 1969. Laurie Scott Baker has been involved in experimental music since he was a teenager. A pioneer of live electronics and graphic scores back in the 60s, a member of the Scratch Orchestra & Peoples Liberation Music with Cornelius Cardew, played many first performances of new music: West End shows 'Hair', and the like, played with Alex Harvey and recorded with Robert Wyatt, Manfred Mann, & many others. He also did a long stint at the BBC as a dubbing mixer. Recently released "Liquid Metal Dreaming" CD with Robert Evans, a series of new works based on his love of the harmonic series, open strings & natural divisions. Composed music for film 'Secrets' 1970, & animations UBU, Best Short Film Berlin film Festival 1979, Lautrec, Short Film Palme d'Or 1975 and Echidna 2004. Also Women on the Move 1985, Flight Path Music 2008.